CUB has always tried to reflect the best values of Queen Mary. We pride ourselves for the diversity of our content, our readers and our writers. I was lucky enough to be given the opportunity to cover Theresa May’s much anticipated speech at Lancaster House last Tuesday, accompanying one of the political correspondents. Having experienced the results of the Brexit vote from the newsroom of The New York Times I was excited to be able to see the coverage from another perspective, from another outlet, as the correspondent I was aiding switched from live TV appearances, to a radio commentary for the World Service. It was a unique experience to be able to listen to the speech live, alongside some of the most well respected journalists in the UK, right next to the action. As the speech unfolded there were a myriad of side comments and scrawled notes, before the room burst into heated discussions when the speech concluded. The variation in views and the breadth of knowledge concerning the possible implications of this speech were striking, and I felt like a sponge soaking up the facts and figures, and noting the eloquent way in which these seasoned journalists summarised the key points. The speech made it clear that our Prime Minister doesn’t want to be part of the office any more, but wants to be able to show up at the office parties, and eat the tastiest snacks, and feel free to tell everyone still in the office about all the mistakes they are making. We might have laughed when Foreign Secretary Boris Johnson told The Sun last September that “Our policy is having our cake and eating it.” But it now seems that he was serious, and to have forgotten the context in which that phrase is generally used. For once, Jeremy Corbyn seems to get it. Late that Tuesday morning, Theresa May stood behind a podium emblazoned with the words “A Global Britain,” basking in the imperial glory of the resplendent mansion (“House” appears a rather endearing British understatement) where Zimbabwe was given it’s independence in 1979 (how well has that worked out?) and is currently used to replicate Buckingham Palace in Netflix’s The Crown. You get the idea. May did her best to square the circle. Britain is an “open and tolerant nation.” Britain hopes to remain a “magnet for international talent.” But the borders will be tightly regulated and we would pick and choose which EU laws would be incorporated into domestic legislation: “we will not have truly left the EU if we are not in control of our laws”. Metaphorically baring those typically English teeth, May warned her European counterparts that “punitive action would not be the act of a friend”, apparently forgetting that they have already made it clear – not inviting her to dinner and snubbing her in the margins of those interminable EU summits – that they’ve already struck her off their BFF lists. The Prime Minister is in a quandary. Promising “a smooth and orderly Brexit”, but one that is largely on her own terms and avoids “a disruptive cliff edge.” While “anticipating success,” May asserted that she would continue negotiations until the best deal for Britain was found, and if a bad deal was offered she would not accept it. Not sure how that squares with the two year deadline for departure once Article 50 is triggered in the next few months. This was a speech that one suspected had been drafted largely in response to the unusually leaked criticisms of Ivan Rogers, our former man in Brussels, who suggested that May’s approach was muddled. It was aimed at a domestic audience and the press largely lapped up its nationalistic jingoism. It is an interesting exercise to compare the derision and ridicule with which now President Trump’s rhetoric is covered with these headlines. 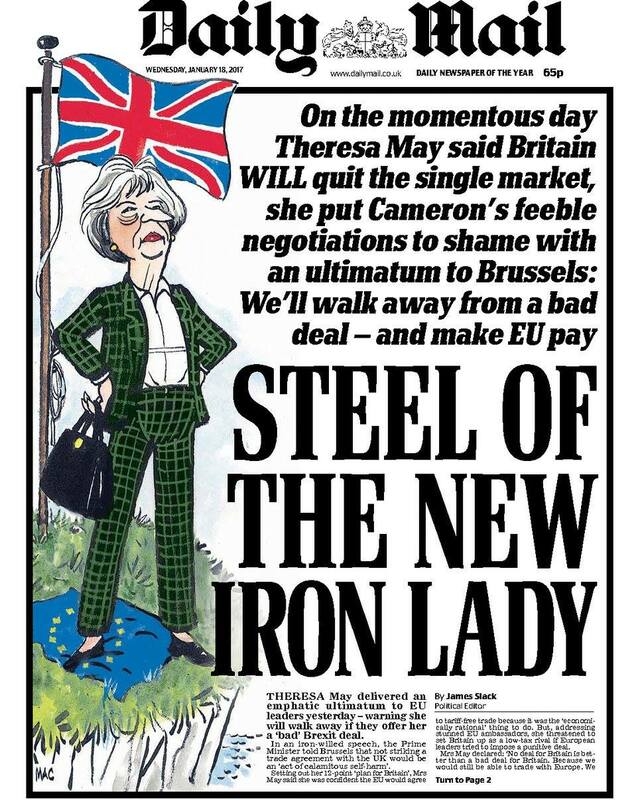 The Daily Mail reported “STEEL OF THE NEW IRON LADY: On the momentous day Theresa May said Britain WILL quit the single market, she put Cameron’s feeble negotiations to shame with an ultimatum to Brussels”. 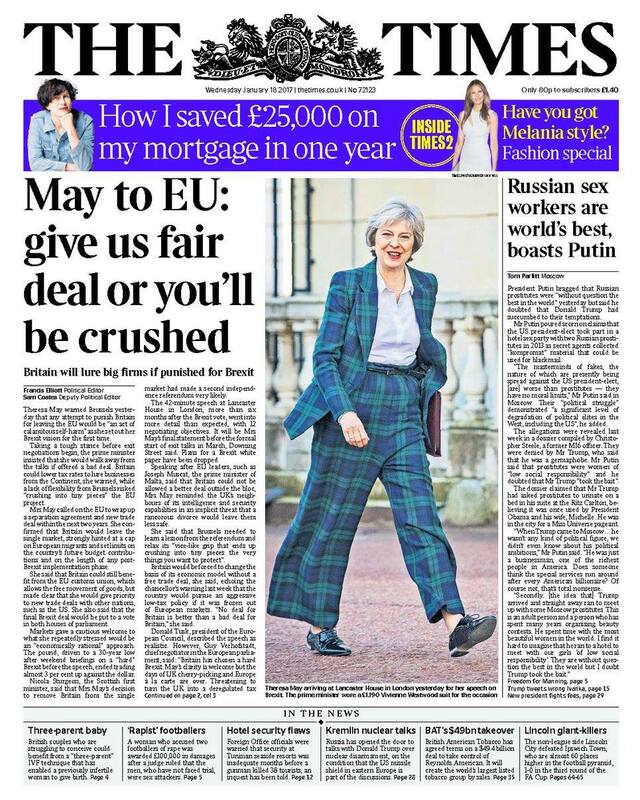 The Telegraph spoke of “May’s bold term for Brexit.” The Times gleefully reported her threat: “May to EU: give us fair deal or you’ll be crushed.” And just like Trump’s Wall, it seems (at least according to the Daily Mail) that we might make the EU pay! 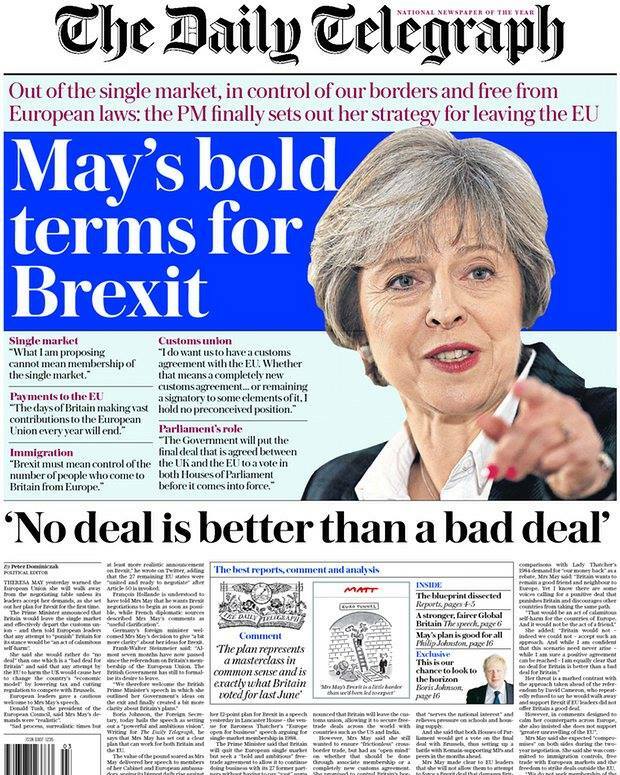 May warned that she would not be giving “blow-by-blow details of our negotiating strategy, the areas in which we might compromise, the places where we think there are potential trade-offs”. This clearly makes sense in what is at heart a sensitive negotiation. 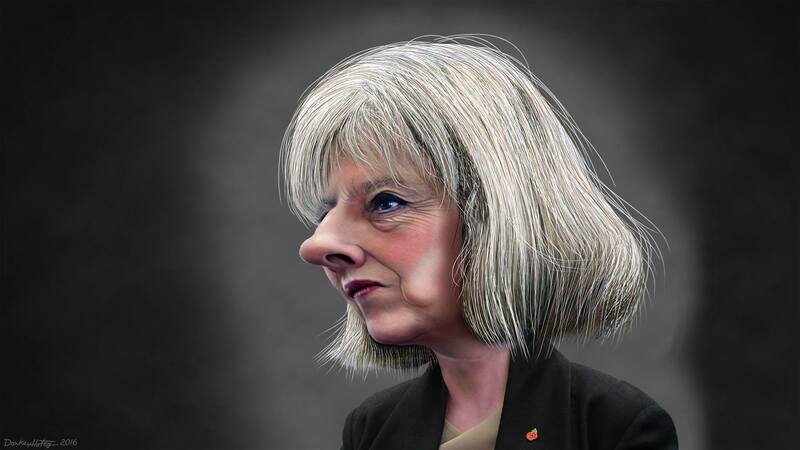 But it seems likely that when domestic criticism mounts, as it surely will, there will be further leaks, further internal Cabinet criticisms, and – inevitably – further speeches by the Prime Minister, whether or not that is still Theresa May – seeking support. The BBC’s Political Correspondent, Rob Watson, neatly summed up the speech as: “the UK Prime Minister is offering a velvet fist to the European Union.” We might have preferred a proffered gloved hand of friendship. But just as Trump is offering a foundation policy of “America First”, May is offering to “make Britain Great again”. Do they share speechwriters? I’m confident that they follow each other on Twitter. So what does this all mean for Queen Mary? Our university is one of the most diverse universities in England, taking in hundreds of international students every year. My only fear for the students of the future, once Britain has officially left the EU, is that they will not be able to reap the benefits this diversity brings to the student body. One of the aspects of my time at Queen Mary which I will be most grateful for once I leave this June is the range of different cultures, people, and views I have been exposed to. I hold on to the hope that even if the university establishment begins to slack when it comes to diversity, that the Student Union, and CUB Magazine will continue pushing diversity in all they do. A well written piece which I can relate too. I would like to say that , in my opinion, people will still come to the uk for our universities and the jobs our economy can currently provide. Yes there is a divide between remain and out voters . But democracy sometimes comes at a cost. Perhaps the economy could collapse. Perhaps the whole EU club will seperate. Who Knows? People will always fear uncertainty as we all like to feel a degree of control over our lives . But what is the worst that can happen? ( not a Dr Pepper moment). I think a lot of the governments plans appear to be vague due to situation we are in . We must remain flexible and not commit to policies now which could cost us leverage at the bargaining table. One thing is certain. The uk , over the next two years , will find out who their friends are.